During the American Civil War (186-1865), Union Gen. John G. Foster led 10,000 infantry and cavalry from the Federal garrison at New Bern, North Carolina, on a raid to the Wilmington and Weldon Railroad near Goldsboro. The action was designed to disrupt the supply line to the north and support Gen. Ambrose Burnside's attack at Fredericksburg, Virginia (ultimately ill-fated). Also known as Foster's Raid, the Goldsboro Expedition in December 1862 was a series of battles initiated by Union General John G. Foster from New Bern to Goldsboro, with military objectives of destroying the railroads, depots, and vital Goldsboro Bridge. The Goldsboro Expedition (named Goldsborough at the time) was also important because it demonstrated that the Union forces had the ability to advance from the North Carolina coast, through eastern North Carolina, and thrust inland to the vital and strategic railroads at Goldsborough. It was an omen of things to come. In December 1862, with the Civil War in its second year, Brig. Gen. John G. Foster, the Union commander at New Bern, organized a large overland raid to Goldsboro to coincide with Maj. Gen. Ambrose E. Burnside's attack on Gen. Robert E. Lee's position at Fredericksburg, Va. The two Union commanders thus intended to prevent either Confederate force from reinforcing the other. The object of Foster's raid was to destroy the Wilmington & Weldon Railroad bridge over the Neuse River at Goldsboro, thus severing the rail line that was shipping valuable supplies from the port at Wilmington to Virginia. On 11 Dec. 1862 Foster set out with 10,000 infantrymen, 640 cavalrymen, and 40 artillery pieces. At Kinston, he deployed his force to approach the town from an unanticipated direction on 13 December. A Confederate regiment briefly defended a partially destroyed bridge over a tributary of the Neuse River and then retreated to the main Confederate line two miles south of the bridge. Early on the morning of 14 December, Foster attacked the well-chosen Confederate position, outnumbering the enemy by more than five to one. The left side of the Confederate line collapsed and retreated across the bridge, mistakenly setting fire to it before the rest of their comrades could cross it. Consequently, 400 southerners were trapped and captured. 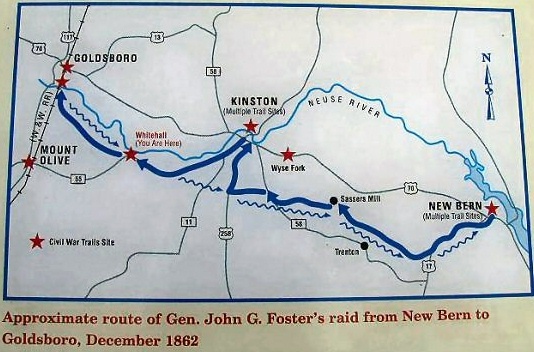 Foster's men crossed the river and entered Kinston, the defenders retreating before them. Meanwhile, Burnside had met with a bloody repulse at Fredericksburg. 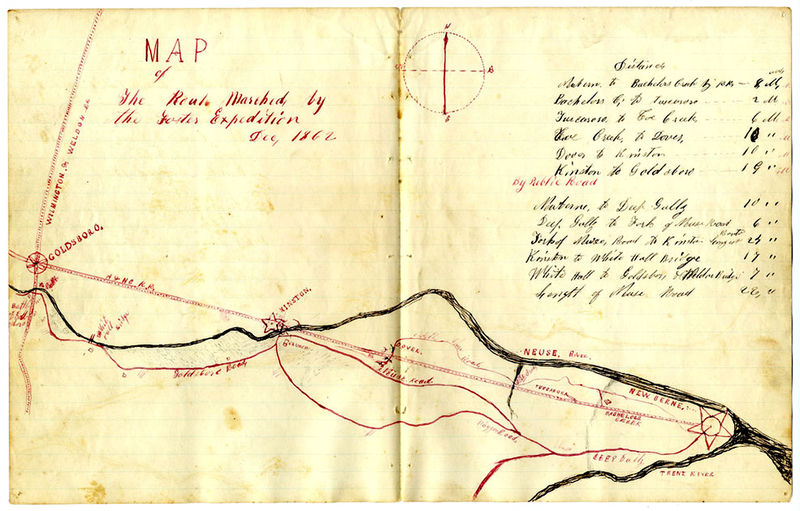 (About) Map of The Route Marched by the Foster Expedition Dec, 1862” Newton Wallace, Company I, 27th Massachusetts Infantry, drew this map of the route the Foster expedition took through eastern North Carolina, moving from New Bern to Goldsboro in December 1862. It includes towns, railroads, roads, water features, and a list of distances traveled. The Battle of Goldsboro Bridge (sometimes spelled “Goldsborough” Bridge), noted on the left-hand side of the map, took place on 17 December 1862. Courtesy North Carolina Collection, Wilson Library, UNC Chapel Hill. On the morning of 15 December, Foster recrossed the river and advanced westward, stopping for the night four miles outside of Whitehall (now Seven Springs) and sending a reconnaissance party with artillery support toward the town. This force encountered Confederate cavalry crossing the bridge over the Neuse River and setting fire to it. The Union artillery was unlimbered and began shelling the Confederates across the river. Damaged in the bombardment was the incomplete hull of the CSS Neuse, which was under construction there. Foster's main force arrived on 16 December and entered the fight, the massed Federal artillery sweeping the north side of the river from a commanding position. But the Confederates fought stubbornly before retreating at nightfall. On the same morning Foster had sent a detachment of New York cavalrymen to Mount Olive Station on the Wilmington & Weldon Railroad, where they dismantled a section of track. After the Battle of Whitehall, Foster continued toward his main objective, nearing the railroad bridge at Goldsboro early on 17 December. He sent parties to Dudley Station and Everittsville to destroy railroad property in both locations. He also ordered five regiments to burn the railroad bridge at Goldsboro. Sheer firepower and weight of numbers forced the defenders on the south side of the river to retreat over a small span near the railroad bridge. As the Confederates hurried across the river, a Union lieutenant dashed for the bridge to put a torch to it. To prevent any attempt to save it, Foster trained all of his artillery on the bridge. When the vital bridge appeared to be engulfed in flames, the Federal soldiers returned to New Bern, believing that they had accomplished their mission. Although Foster was satisfied with the success of the operation, damage to the bridge was merely superficial. Within two weeks the railroad was fully operational. The most significant damage from the raid was to personal property, crops, and livestock. Goldsboro Expedition, by D. H. Hill, Jr. Recommended Reading: The Civil War in the Carolinas (Hardcover). Description: Dan Morrill relates the experience of two quite different states bound together in the defense of the Confederacy, using letters, diaries, memoirs, and reports. He shows how the innovative operations of the Union army and navy along the coast and in the bays and rivers of the Carolinas affected the general course of the war as well as the daily lives of all Carolinians. 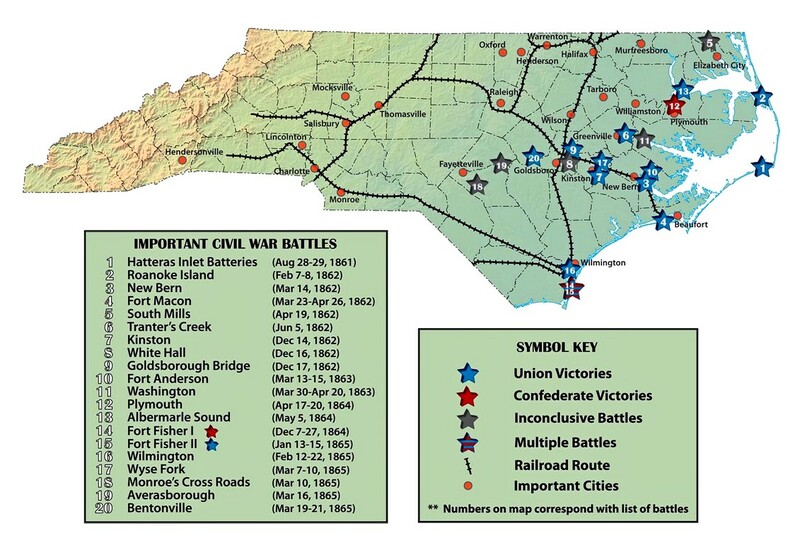 He demonstrates the "total war" for North Carolina's vital coastal railroads and ports. In the latter part of the war, he describes how Sherman's operation cut out the heart of the last stronghold of the South. Recommended Reading: Storm over Carolina: The Confederate Navy's Struggle for Eastern North Carolina. Description: The struggle for control of the eastern waters of North Carolina during the War Between the States was a bitter, painful, and sometimes humiliating one for the Confederate navy. No better example exists of the classic adage, "Too little, too late." Burdened by the lack of adequate warships, construction facilities, and even ammunition, the South's naval arm fought bravely and even recklessly to stem the tide of the Federal invasion of North Carolina from the raging Atlantic. Storm Over Carolina is the account of the Southern navy's struggle in North Carolina waters and it is a saga of crushing defeats interspersed with moments of brilliant and even spectacular victories. It is also the story of dogged Southern determination and incredible perseverance in the face of overwhelming odds.